Want to know which buyers are getting a great deal–and, who’s getting stiffed? More than ever, now you can. Move over Kelly Blue Book: On January 1st, Yahoo Autos will show consumers and retailers exactly how much new and used cars are selling for in your area. Powering the new Yahoo Autos is transparency advocate, TrueCar, which publicizes the price data for over 90% of new and used cars. “We feel that TrueCar has created a compelling service that helps remove much of the guesswork for in-market consumers,” Brandon Huff, Vice President of Yahoo! Commerce, tells Fast Company. The new information allows consumers to know if they’re getting a good deal, relative to other buyers in the area. “When customers can be in control of the process and be empowered with up-front, no-haggle, competitive market-based pricing, they have a dramatically better retail experience,” says Scott Painter, CEO of TrueCar, in an email to us. His company recently inked a $200 million funding round. Now with Yahoo Autos, TrueCar’s transparency database is inching its way into competing with established competitors, such as Kelly Blue Book. TrueCar prides itself on revealing the previously unknown gap between the highest and lowest car prices. 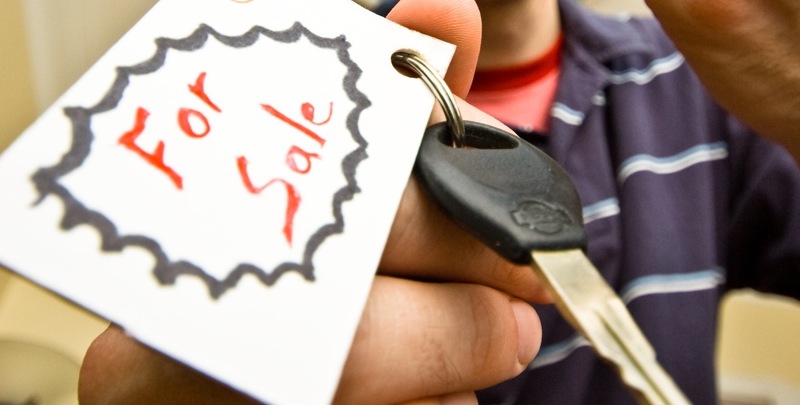 The average variation in car sales price is an astounding 23.2%, according to Painter. On a $20,000 car, that’s plus or minus $2,506, which means the most susceptible consumers are paying about $5,000 more than the savviest buyers. Painter contends that price concealing is actually bad for retailers as well as consumers. Most consumers, he says, are unaware that sellers only make $640 in front-end gross on the average car sale and, therefore, would be willing to negotiate a price 300 to 400 percent higher. According to a commissioned survey by Synovate [PDF], 55% of respondents wrongly believe that most dealers make a 10% profit on a sale. Follow-up questions show that they would be willing to negotiate a price that, on average, gives dealers a 4.5% commission (or $1,800 on a $40,000 car). In a world without much negotiations, Painter (optimistically) argues that dealers would actually make more money than they currently do. The ambitious goals imply a move away from Kelly Blue Book, one of the mainstays of consumer price comparison data, which gives a suggested price for a new car based on a sampling of prices within a given region. Instead, TrueCar publishes the entire distribution of sales prices in the last 30 days in local, regional, and the national market. 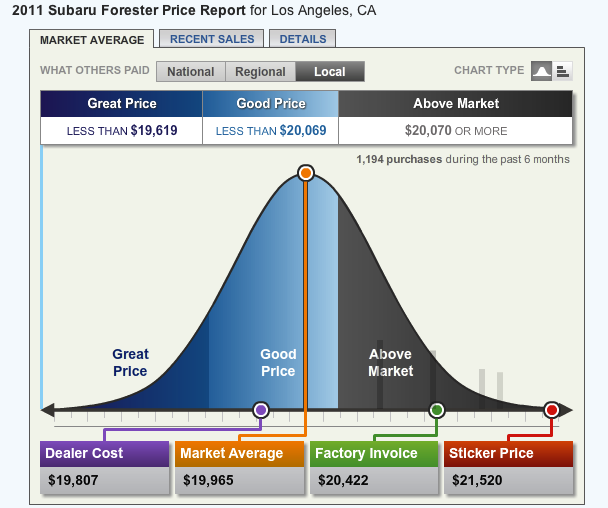 Looking at a distribution of 2011 Subaru Forresters in the Los Angeles market, for example, we can see how many people paid what price. TrueCars growing popularity convinced Yahoo to supplement their old database with TrueCar’s. “Over the past few years, the market has seen a shift towards greater transparency playing a critical role in the car-buying experience,” Huff continues. The TrueCar partnership is a three-year exclusive deal, which guarantees Yahoo $150 million from TrueCar, while sending 10 million monthly visitors from Yahoo to TrueCar. (Yahoo currently gets a little over 15 million monthly uniques, according to Huff). It is still unknown whether TrueCar’s database is actually shrinking the price distribution of cars in a local market. Logically, under complete transparency, the price variation should begin to shrink to a stable, fixed price, since undervalued dealers will know they can sell for a higher price, and buyers will reject offers at above the market average. Painter, however, says that they only have “anecdotal” evidence that such shrinkage is occurring. To understand whether transparency will have an effect, the closest comparable market is the airline industry, where the popularity airline comparison sites opened up the previously opaque market of ticket prices. University studies have found that the Internet does reduce variation in tickets prices and also slightly lowers prices. However, the Internet’s effect on the airline industry is likely smaller, since there are few consumers that need to buy a car at the last minute or can haphazardly charge a car to a company expense account. So, while we know that the Internet’s transparency does have some effect on prices, it remains to be seen whether it will be as dramatic as TrueCar and Yahoo are betting it will be.